Gait Tests can consist of simple exercises (moving from A to B), but also of more complex ones, such as ‘roundtrip’ or walking backwards. They can be more complex, if needed, adding obstacles (e.g. plastic cones) or actions to be carried out between the various gait phases (sitting down and getting up before coming back, for example) or simultaneously. Dual task and obstructive task walking, can be easily measured here. 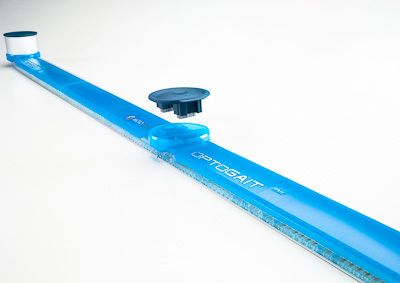 Thanks to the practical and innovative assembling system using caps, the modular system is assembled in a few minutes and does not require cables to connect the bars or further net adapters. The length goes from a minimum of 2 meters to a maximum of more than 100 meters. 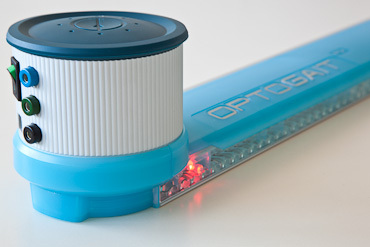 Positioned on the side bars of any treadmill (simply leaned on or permanently fixed with adhesive-tape), OptoGait becomes a portable lab for small spaces and with reduced costs. The system is compatible with the wide majority of treadmills and no synchronization is necessary to start and carry out a test. Stance phase: The stance phase is the supporting phase of each gait cycle. It begins with the contact of the heel and finishes with the set off of the tip of the same foot. It is therefore the time between the first and the last contact of two consecutive supports of the same foot. It is also presented as a percentage of the total gait cycle.